Marcel bought himself an iPhone 4S last week, and it quickly became apparent that Siri wasn’t very good at understanding him, and a quick video search reveals it’s a common problem for people with Scottish accents, including me (watch this one, too, if you haven’t seen it yet). Apple claim Siri will get better at understanding its owner over time, but I’m somewhat doubtful whether it can be true. I’m sure it can relatively easily catalogue a speaker as west-coast American or Australian or whatever (if those accents have been programmed into it), and within those types it can then store typical values for each phoneme, but given that it never asks the user to type in a word or sentence it couldn’t comprehend, how can it possibly learn anything if an accent diverges too much from its expectations? I understand Apple want a product that people can just switch on and use, but for people with “strange” accents, surely it would be better to have the option of a dedicated training module rather than being stuck with a useless piece of software. When I wrote this, I had never tried to drive a car with automatic transmission. However, during our recent holiday in Tuscany, we rented an automatic Lancia Delta Sport, so I got the opportunity to try it. At first I hated it! It seemed to disengage the engine just as I was trying to go faster for the purpose of changing gear, and in the same way slowing down was interrupted at the wrong time. With time I got used to it, though, especially after I found the manual override – it allows the driver to select plus to go up a gear and minus to go down one, which is useful to anticipate the gear change. However, it did show me what the problem of my old suggestion was: If the driver is slowing down, the best gear change depends on what happens a few seconds ahead. For instance, if the driver goes down from 40 to 30 and then back up to 40, it might be best not to change the gear at all, whereas if the change for 40 to 30 is followed by a further deceleration to 20, it would have been better to lower the gear sooner rather than later. The car cannot know this, however, so it will have to err in one of the two situations. 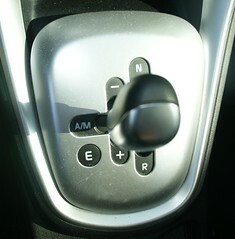 The only way to make a better automatic drive would be for the controls to be different. If for instance cars had a control for target speed and a brake, in the first scenario the driver would leave the target speed at 40 but press the brake to go temporarily down to 30, whereas in the second scenario the driver would alter the target speed to 20 without pressing the brake at all. Phyllis has nagged me for some time to get new mobile phones for Complexli, so yesterday I finally called T-Mobile and got the price of our contract reduced by 50% and got two new phones: an HTC Wildfire S for Phyllis and an HTC ChaCha for me. So far I really like it. The keyboard is very good, much better than what you find on BlackBerries, for instance, and it has a front-facing camera for video conferencing. It also has a Facebook button, which probably will seem quite old-fashioned in a couple of years’ time, but for the time being it’s quite handy. The downsides seem mainly to be the size of the screen (it’s OK, but some apps are clearly designed for bigger screens), and the battery life, which is sadly quite typical for a smartphone. All in all I must say that I’m quite a happy bunny! When we lived in Rose Street, we had just the normal terrestrial TV channels. However, when we moved to Newton Mearns three and a half years ago, we decided to get Sky to please the kids. We didn’t get Sky Movies or Sky Sports, but we still paid £23.50 a month on top of the TV license. 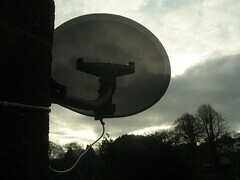 However, the penny finally dropped last month that we were paying £23.50 for just a few channels more than what is freely available through FreeSat, and that our old Sky satellite dish was perfect for FreeSat reception. So last week we bought a Humax Foxsat HDR 500GB Freesat HD Satellite Receiver and Digital TV Recorder , and it works beautifully. It gives us a few channels in HD (which we didn’t have before), a bigger harddisk for recording programmes, and a more modern menu system. We’re just wishing we had ditched Sky years ago! Author thomasPosted on 2011/06/11 2011/06/11 Categories en, gadgets, mediaLeave a comment on Bye Sky! Help!!! How hard can it be to get better sound from a standard TV? I’m really not an audio person, and I’m getting awfully confused. All I want is to get slightly better sound (preferably surround sound, but just stereo would do me) from my TV, especially when watching films on the Blu-ray player, but also when playing games on the Xbox and watching stuff on Sky, and I don’t want to pay much more than £50. Last month, we finally decided to get rid of the enormous 50″ telly that Phyllis had got in her divorce (and which had replaced my old 14″ one), on the grounds that it was far too big for our TV room, which meant that there was hardly any space left for furniture, which can be a problem when there are seven of us living here. Given that neither Phyllis nor I are TV people (we tend to watch one hour a week, plus perhaps a film when the big kids are away), we didn’t want to waste money on this, so we bought a 32″ LCD TV by Technika at £300, and to splash out a bit and please the kids we also bought a £50 Blu-ray player. We got almost £90 for the old TV on eBay, and everything is fine – the room now has space for six adults instead of four, and the picture is much better than before. However, the built-in speakers aren’t great, and good Blu-ray movies really suffer a bit from this. In an ideal world, I’d buy an AV receiver (with prices starting at £140) plus speakers, but it’s simply ludicrous to pay almost as much for the sound as for the TV itself, and there are many other things we’d rather spend that much money on (money tends just to disappear into thin air when you’ve got five kids!). The TV has a coax audio out thingy, so I’ve been trying to find some speakers that could be attached to this, but although some of them look like they just might work (such as the Logitech Z506), none of them state unequivocally that will take coax audio signals from a TV and do the rest. I’ve also become a bit worried after reading this: “Due to copyright laws, it is not possible to output video/sound from the TV on certain sources, i.e. HDMi, DVD etc. If you want to have surround sound while watching a DVD, you will need to purchase a ‘home cinema’ style DVD player with its own surround sound system.” Can this really be true? Our Blu-ray player also seems to have a coax output, but would systems such as the Logitech one accept two distinct coax inputs? Also, why are Tesco selling £20 5.1 surround speakers if there is no way to connect them to a TV of the same brand?!? Author thomasPosted on 2011/02/14 2011/02/14 Categories en, gadgets, media9 Comments on Help!!! How hard can it be to get better sound from a standard TV?